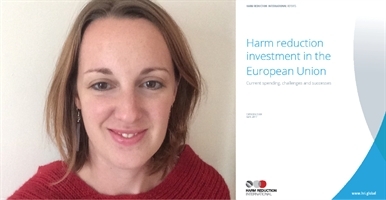 Harm Reduction International (HRI) recently published a report on harm reduction investment in the European Union, providing a snapshot of investment in harm reduction services in 18 EU countries. It highlights alarming shortfalls in funding for vital harm reduction services in several countries. We spoke to HRI’s Head of Research, Catherine Cook, about the research and what it revealed. What did the research project set out to do? ‘This report is part of a project called Harm Reduction Works! The overall aim is to build the knowledge and capacity of civil society to be able to advocate for investment in rights-based harm reduction programming within the EU. With this research, we set out to fill a knowledge gap on funding levels and challenges and successes. What’s the good news – where is there good investment in harm reduction? ‘We categorised the funding situation as being green, amber or red, so the countries that scored mainly green are the best in terms of the health of harm reduction funding. We ranked The Netherlands, Germany and France as the top three, with Belgium, Ireland, the UK and Estonia after that. ‘We identified common factors in those countries that were mainly green. The first was political support for harm reduction at the national level, but also at the local level. It was really interesting to me, to see how political support and decision making at the local level had a massive impact on service provision. In quite a few countries, including the UK, those decisions are increasingly being devolved to local level. Without having an overall obligation for local decision makers to put money into harm reduction, that’s quite dangerous for the services. ‘For example, in Italy, the majority of the country has some harm reduction in place but there are whole regions that have nothing at all. During the project, harm reduction interventions were added to the national essential services list, which was a big success for advocates in Italy. They are one step closer to having that guarantee that local government will put harm reduction in place, with the money to back it up. Where are things looking bleak? ‘We had a few countries categorised as mainly red – Bulgaria, Romania, Hungary, Greece and Poland. Some of these countries are experiencing funding crises for harm reduction that require urgent action. ‘There were also common factors underpinning the problems in some of those countries. We saw the impact of austerity on harm reduction funding, and Greece was the prime example of that. There was also the issue of international donor funding being withdrawn and the funding gap being left unfilled by government investment. The third factor was poor political support for harm reduction in general. What’s been the direction of travel over the past decade – are things improving or getting worse? ‘In Europe, I think it’s fair to say it’s mixed. In some countries, harm reduction is deeply embedded in the general approach to drugs and health, and funding for harm reduction interventions has been pretty steady. In some of those countries, there has been a broadening of harm reduction interventions, with drug consumption rooms, safer nightlife interventions, heroin-assisted treatment, and improved harm reduction in prison services. ‘But it is such a diverse region, and there are countries that have been wholly reliant on international donor support to fund harm reduction services and where that’s dwindling the result is catastrophic. Then there’s also the impact of austerity and cutbacks related to that. What are the impacts of funding cuts and pressures on the ground? ‘In those countries where the services have been completely decimated or are likely to be in the future due to donor withdrawal and lack of government support, people are really being left in desperate situations. In Hungary, Romania and Bulgaria for example, despite the tireless efforts of harm reduction advocates, governments remain for the most part unconcerned about the consequences of cuts to harm reduction services and those people whose lives will be, or have already been affected. I was also struck by the reports from many countries of huge pressures on harm reduction workers, being tested to their limits but remaining utterly committed to their roles, prioritising that over their pay and over their lives outside work. In Portugal for example, the cost of living has gone up and that hasn’t been matched by increased funding. They are really stretched, and doing a lot of unpaid work to keep services going. What needs to happen to turn that tide? ‘First and foremost, there must be a response to the funding crises. Of course, ideally this should be governments stepping up and funding harm reduction services, but we know this is not likely in some countries. We call on the Global Fund to do more to ensure a responsible transition from donor-funded programmes to those funded by government. We recommend there should be a time-bound emergency fund established by the European Commission to keep services in operation in countries where these are being cut. We also would like to see a joint effort from the Global Fund and the European Commission to figure out how they can fund harm reduction in those countries where funding has been decimated. There’s a lot of work to be done to advocate for this. ‘It was clear from the research that we as a sector don’t know enough about harm reduction funding, in any country. One of the recommendations we make in the report is that there should be national efforts to track this. It could be done by European institutions or by government, but civil society needs to get informed about funding so they are ready to advocate for increases and changes in funding. You can download the full report and a policy briefing from the HRI website. This eFeature appeared in the July 2017 edition of the Eurobulletin.